Frank Wetzstein, John Kennelly and Fred Sommerfeld as officers of the Palace Theatre Company announced in March 1936 the addition of a new motion picture theater to Main Street. They purchased two lots in block 8 downtown previously occupied by the Orange Grocery and Conyne Jewelry. Site demolition began in April 1936. The new building included street-site store space on either side of the main entrance where Conyne Jewelry and the ND Power and Light Company (which later became part of MDU Resources, Inc.) relocated. Facing south toward the street, the theater's ticket office was set behind the entrance lobby 14 feet by 40 feet long. The auditorium was 48 ft x 80 ft in size with a seating capacity of 650. Although the back of the theater is at street level, the floor slopes down to the recessed stage level which ensured full visibility of the main screen from every seat. 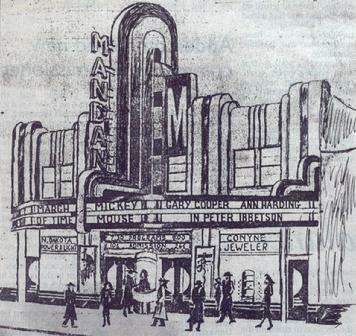 Originally opened as the Mandan Theatre, it was based on designs from similar movie theaters in Minneapolis area. Construction began on April 1 and opened in November 1936 featuring Shirley Temple in "Poor Little Rich Girl." A giant neon sign dominated the front of the showhouse flashing the name "Mandan" in shades of black and red and green. In the sign were 970 feet of neon tubing and 300 light bulbs. A unique feature of the theater was a "crying room" in the balcony for parents with babies. The room had sound-proofed walls and thick plate glass windows so "mothers can still see the motion picture while Junior shouts his loudest." The room was also equipped with its own loudspeaker. 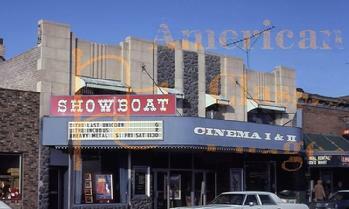 The building underwent a $100,000 renovation and re-opened in November 1974 as the Showboat Cinema in 1974. The single-screen theatre was equipped with 412 seats. Two years later in an attempt to compete with the Kirkwood Plaza Multiplex and Dakota Theater multi-screen conversion in nearby Bismarck, space in the adjacent building was converted to a smaller 144 seat theater and opened as "Cinema II" and shared common ticketing and concession areas with the larger primary theater dubbed "Cinema I". The Showboat closed in early 1987. However in May of that same year, Mid-Continent Theaters was awarded the bid to lease the building, remodeled it and reopenned it on June 1 as the Academy Theater. Upgrades to the 400-seat Mandan show hall included an improved sound system, reconditioned seats and lobby. It operated as a discount movie theater, with admission only 99 cents to see second-run movies. After its close the following year, ownership would change hands and host a franchise of Cici's Pizza buffet restaurant, but that too would close in about a year. In 2004, the building would be aquired by the Mandan Remediation Trust and City of Mandan as part of project to remove groundoil which had been spilled to the groundwater table in the downtown area. 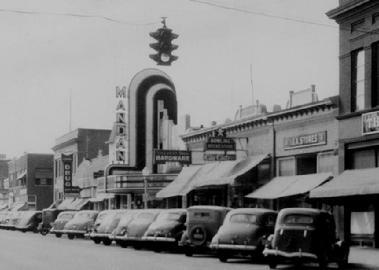 In 2007, the City of Mandan asked for proposals for redevelopment of several downtown properties. Sandi and Scott McFall play to convert the building to a live-entertainment and dinner theater venue was accepted and the building sold to McFall Publishing for $1. 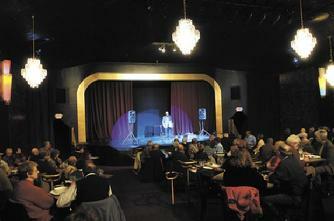 The $500,000 renovation project started in March 2008, Mysteria Theater opened in December. The building was rewired, replumbed and refurbished including new lighting and sound systems. Five coats of wax were troweled onto the walls and small pieces of glass shot into the black ceiling, creating a sparkling canopy above diners. The main room features four art deco lights from the original theater and seats 150-180 for dinner. The sloped floor from the original structure has been converted to level terraces stepping down to the 30-foot stage and its fiber-optic curtain, which once hung in Caesar's Palace in Las Vegas. 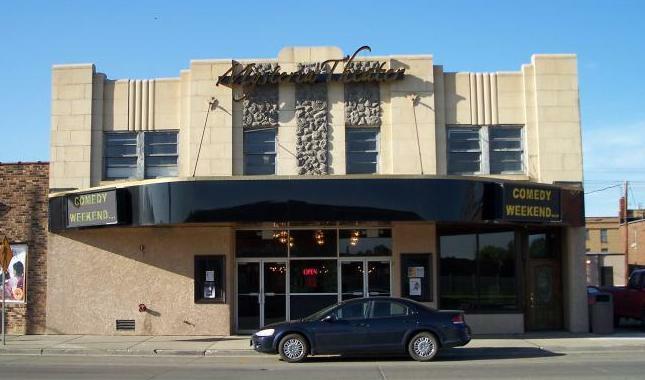 Now featuring a complete kitchen and expresso and traditional bar, Mysteria Theater offered a live-entertainment and dinner theater shows to the Mandan-Bismarck area. In September 2011, the business and building was sold. Leveraging the Art Deco architectual style of the building, the restaurant's and bar theme was changed to the Roaring 20s and the business renamed "Chicago Place". The bar operated until March 2012 until it closed.